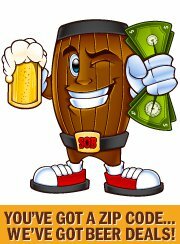 SaveOnBrew.com is not just a place to find over 350,000 of the cheapest advertised beer prices nationwide, but also a source of quality entertainment. The Cheap Beer Blog is designed for a college and post-college crowd who love women, beer and espousing their opinions over a pint. More info at http://www.SaveOnBrew.com/blog. Since 2010,SaveOnBrew.com has been alerting the masses to the absolute cheapest advertised beer prices in their zip codes. Whether consumers are looking for rock-bottom prices (Busch – 58 cents per can at CVS) or a special sale on their favorite beer (Sam Adams $1.33 per bottle at Tops), SaveOnBrew.com is the only beer price-search engine that covers the entire nation. That in itself makes it special; but now the founders have launched an exciting new blog to entertain the throngs of beer lovers and connoisseurs who come their way. Fans of the Cheap Beer Blog have the option of subscribing so posts are delivered to their inboxes as soon as they’re published. Super Geeks can also sign up for the RSS feed if they so desire. In addition to providing quality entertainment, SaveOnBrew.com recently launched their mobile app to allow thirsty beer drinkers to search for the cheapest advertised beer prices in their town while on-the-go. About SaveOnBrew.Com: Founded in 2010 to help thirsty beer drinkers across the United States find the lowest advertised prices for one of the world’s most popular beverages.